The single storey provision for children with autism has been constructed on a vacant site next to Newfield School and was opened last October. Motivational speaker Shaun Gash addressed the ceremony alongside Blackburn with Darwen Council’s Chief Executive, Harry Catherall, and Headteacher Geoff Fitzpatrick. There was a touching choir performance by the pupils of the Greatest Showman’s ‘This is Me’ and an appearances by Blackburn Rovers goalkeeper, Jayson Leutwiler, and Rover the mascot. 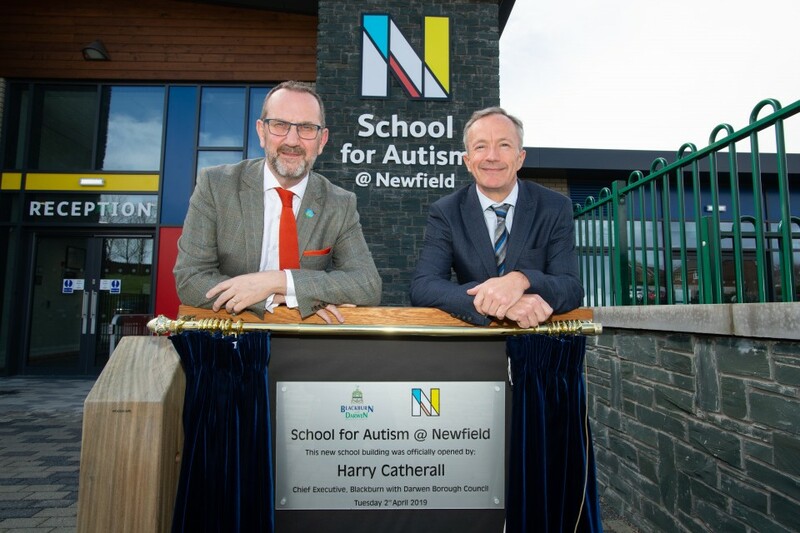 The new school for autism at Newfield has been specially designed to meet the needs of children with autism and features a specialist sensory space, multi-use areas, hall and kitchen facilities. This is linked through a corridor back into the existing main building. The school has been designed with a ‘cluster’ approach where all services are close to each other. There are three main clusters catering for early years and primary, secondary and post-16, including a high dependency wing. Geoff Fitzpatrick personally carried out specialist research on the design, to ensure details such as all the fixtures, fittings, lighting and colour-schemes were suitable to create a calming and nurturing environment for the children and young people. He worked collaboratively with architect Tim Potter to ensure all aspects of the design met the exacting needs of children with autism. We are extremely proud to of what has been achieved here. I’d like to thank the Council for their support in making this happen and recognising the need to have such a unique and specialist facility that has been designed to fully meet the needs of all our learners on the autism spectrum to give them the best outcomes. The local authority capital programme has paved the way for this build and extensive landscaping for Newfield School on the former Crosshill School site. The Council understood the importance of providing this unique facility after carrying out a comprehensive review which identified that there was a need to make best use of the skills and knowledge contained within the Borough. We wanted to help ensure that children and their families could be educated locally without having to travel further afield to access specialist support out of the area. The work the staff are doing at Newfield to provide this specialist support is a credit to them and the school’s leadership. To see the children flourish in this environment where they are happy and doing what they enjoy is very rewarding. The school has over 60 places for pupils with autism. The opening had been timed to align with World Autism Awareness Day which is an annual event aimed at raising awareness of the needs of people with autism which is promoted by the National Autistic Society, and other charitable organisations. It helps to raise awareness of services and support available locally and nationally. Blackburn Rovers were delighted to receive the invite to support the official opening ceremony. Newfield is such a unique and specialist school that is already helping so many children and young people in the borough. Jayson Leutwiler, our disability sports ambassador, and Rover the Dog were there to meet all the dedicated staff at Newfield, the children, parents and all the partners involved in bringing the vision for the school to reality. The very much enjoyed meeting everyone on the day. Demand for specialist educational support for children on the Autism spectrum has increased over recent years due to improvements in diagnosis of the condition. I was very humbled with the invitation for me to be part of this amazing and momentous day. I really enjoyed meeting everyone involved in this incredible specialist school. We all have our challenges in life and its vital that those in society, most in need of help and support get the kind of support they deserve to help give them the best chances in life.